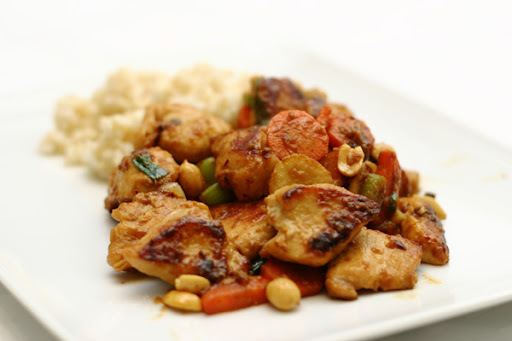 I saw this recipe at Jenn Cuisine (a gorgeous blog if you haven't seen it!) and couldn't wait to try it. During the summer, my husband likes to take wraps to work since they are light and don't need to be heated. Ina's chinese chicken salad had been the staple for a while, but I figured I'd change it up with this one. We really love this recipe and I can't wait for my basil plant to grow enough that I can take a second harvest and make more! I made half the amount of pesto listed below, with all basil and no arugula (so, 3 cups of basil). It was the perfect amount for the 3 cups of chicken. 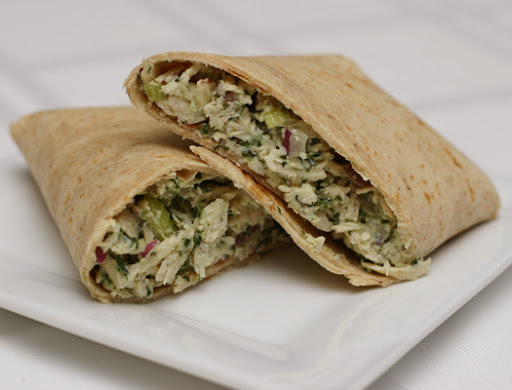 Enjoy with a salad or on a whole wheat wrap to make it clean. 1. Combine chicken, celery, onions, and olives in a large bowl. 2. Set oven to broil. Toast pine nuts for about 5 min, or until golden brown. Careful not to burn them! 3. In a food processor, add basil and arugula and pulse til chopped . Then add in the lemon juice, garlic, EVOO, parmesan cheese, pine nuts, yogurt, salt & pepper. Pulse until smooth. 4. Add about a cup of the pesto mixture to the bowl of the chicken salad mix, add in the almonds, and toss until all is coated. 5. Serve on a bed of arugula and garnish with more sliced almonds. Eat! I'm a little (ok, a lot) late on my Barefoot Bloggers recipes this week, but here was the first recipe from July: Pasta with sundried tomatoes. At first I thought it was a warm pasta dish, but as I read on, I realized it was more of a pasta salad - and a delicious sounding one! I finally got around to making it and I am so glad I did. 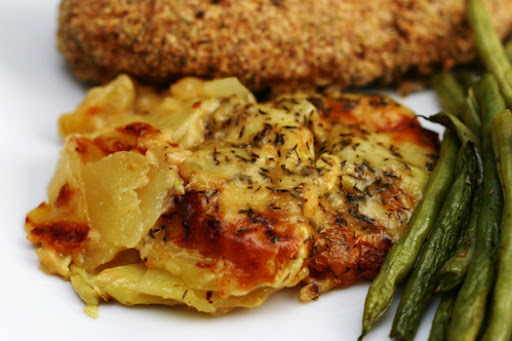 Ina does not disappoint with this recipe! 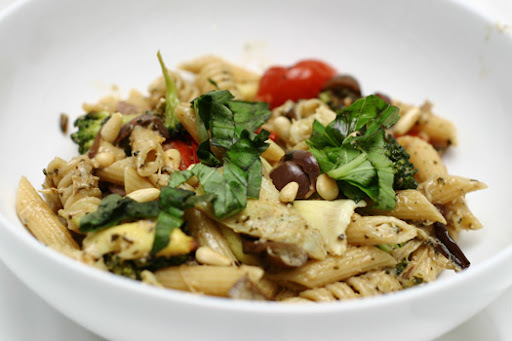 I loved the other pasta salad we've done - pesto, pasta, and peas, and this recipe with be another great alternative in my recipe book to the traditional pasta salads. I found it to be plenty salty as written between the kalamatas and capers, so next time I will cut down the amount of salt in the dressing. Also, I only used 8 ounces of mozarella - there was still plenty to go around! This was delicious. Bridget runs one of my favorite blogs and when I saw this, I could.not.wait to make it. Fantastic combination of flavors, great for summer with it's simple cooking method. 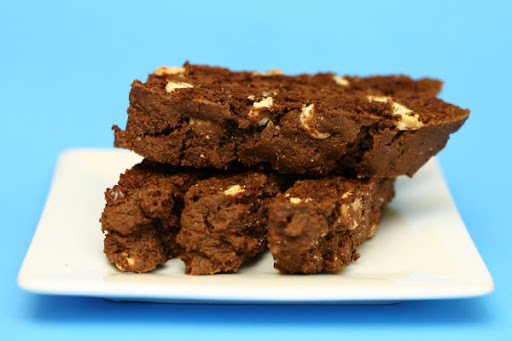 It is a favorite in our house and I think will become a weekly staple! 1. Place the couscous and turmeric in a large bowl and mix. Pour on the boiling water, stir, and immediately cover the bowl with a large plate. Let sit for 10 minutes. Remove the cover and fluff the couscous with a fork. Let cool. 2. Place the pine nuts and unpeeled garlic cloves in a small skillet and toast over medium heat, tossing often, until golden, about 5 minutes. Watch them carefully because they can easily burn. 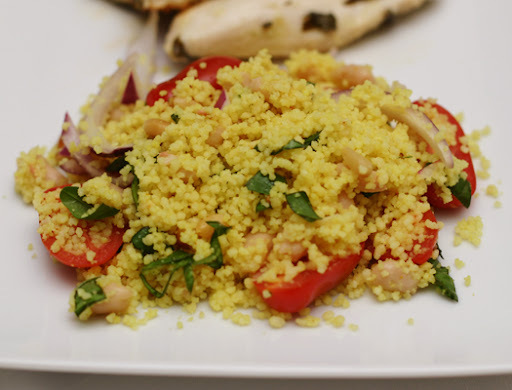 Let the pine nuts cool, then mix them into the couscous along with the beans, tomatoes, basil, and red onion. 3. Mince the garlic. Place the dressing ingredients in a jar with a tight-fitting lid and shake vigorously. Pour over the couscous mixture and toss well. Let marinate at least 30 minutes before serving. Cover and chill if longer than 30 minutes. Serve at room temperature. 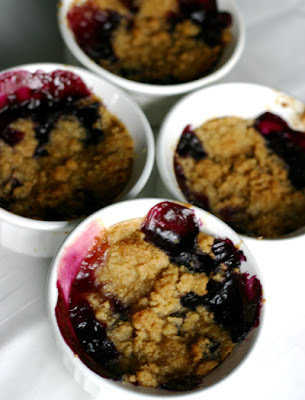 One of this month's Barefoot Bloggers recipes was Peach and Blueberry Crumbles. I made half the recipe and divided it into four 7 oz ramekins for baking. These were just ok for me. I wasn't loving them, but they were good with a scoop of vanilla ice cream. 2. Immerse the peaches in boiling water for 30 seconds to 1 minute, until their skins peel off easily. Place them immediately in cold water. Peel the peaches, slice them into thick wedges, and place them in a large bowl. Add the lemon zest, lemon juice, granulated sugar, and flour. Toss well. Gently mix in the blueberries. Allow the mixture to sit for 5 minutes. Spoon the mixture into ramekins or custard cups. 3. For the topping, combine the flour, granulated sugar, brown sugar, salt, cinnamon, and the butter in the bowl of an electric mixer fitted with a paddle attachment. Mix on low speed until the butter is the size of peas. Rub the mixture with your fingertips until it’s in big crumbles, then sprinkle evenly over the fruit. Place the ramekins on a sheet pan lined with parchment paper and bake for 40 to 45 minutes, until the tops are browned and crisp and the juices are bubbly. Serve warm or at room temperature. If you want to make these early, store the unbaked crumbles int he refrigerator and bake before dinner. Serves 5 to 6. 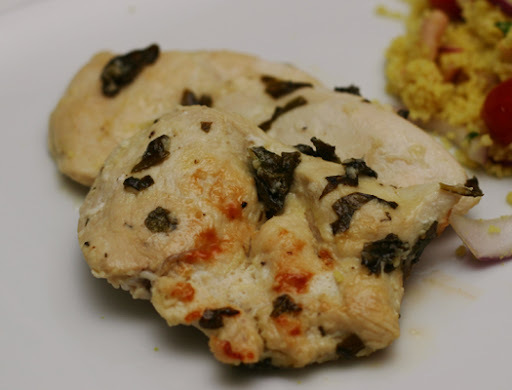 This is a great, light fresh recipe for grilling chicken. Great way to use up some fresh basil! We've made this a few times so far, some on the grill and some on a pan in the stove (as pictured here). We love it! Mix all ingredients together and let marinate for 30 mins to 1 hour. Heat grill to medium heat. Grill chicken until tender and completely cooked through. These cookies are legendary in my family. My mom has been making them for who-knows-how-long, and she basically isn't allowed into any family function without them. Then everyone fights for who gets to keep any leftover cookies. I have recently discovered the same fate with my husband's relatives. One family lives about 45 min away (the rest of our relatives are more like 2-4 hour flights away) and they invited us up for a cookout this weekend. We were happy to be able to visit with them, and I knew I had to make these cookies because they devoured them during our last visit. 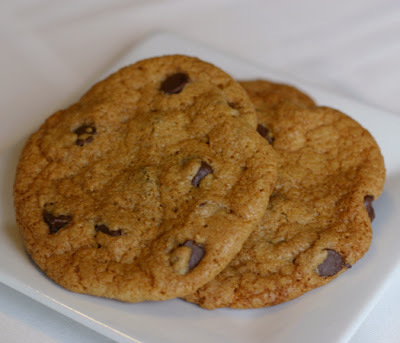 If you are looking for soft, chewy cookies, then these are not for you. They are on the thinner side (mine are exceedingly thin but I made a few substitutions that were perhaps not the best idea), and definitely crunchy. 1. In a large bowl, mix the sugars and melted butter until combined. Add the eggs one at a time, then add the vanilla and stir. Add one cup of flour and the baking soda, stir until incorporated (good for arm muscles if you do this by hand!). Add second cup of flour and incorporate into the batter. Add the last 1/2 cup of flour and combine. Stir in chips and nuts. 2. 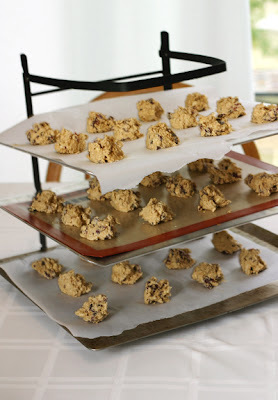 Grease cookie sheets or line with parchment paper. Drop heaping spoonfuls of batter onto sheets. Bake at 375 for 10 to 12 minutes. Allow to cool completely, then enjoy! We love frozen drinks. Normally, my husband is great in the role of bartender, but when I noticed he made them with ice, frozen fruit, and alcohol as the only liquid, I decided to take over. I started by adding some juice, then found our secret ingredient: fruit sorbet. Our freezer was full of it, so why not? It turned out fabulous! This is a great summertime drink that is totally customizable... choose your fruit, juice, sorbet, and type of alcohol to make your own creation. 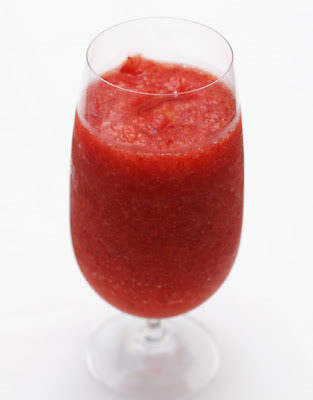 Today we used frozen strawberries, cranberry juice, orange sorbet, and tequila! 1/2 cup liquid - make your own combination of juice and alcohol! Vodka, rum and tequila all work well. For tequila, I recommend 1/4 cup tequila, 1/4 cup juice. 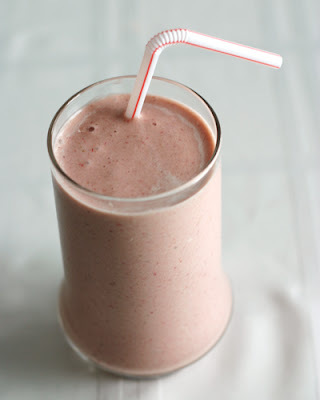 Toss all ingredients in a blender, and process until smooth. Pour and serve! Makes about 2 cups. As I have mentioned before, space is at a premium in my kitchen. There is little counter space and when I am in the throws of baking - there is even less counter space, since heaven forbid I clean as I go. This sometimes leaves me with multiple hot trays coming out of the oven, and not enough space to put them. I have accumulated enough burns to decide that I need some help in this area. 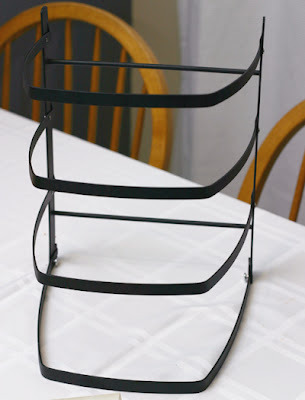 I saw this cooling stand by Baker's Mate in a cooking catalog and immediately made note of it. My sister was kind enough to get it for my birthday, and I was able to put it right to work on the Oatmeal Cranberry White Chocolate chunk cookies. The stand is great and works well - with one major pain in the neck. It is exceedingly difficult to close the last tier on the bottom for storage. Unless I am just missing something, it is very hard to release it from the raised metal areas that keep it locked in place. Aside from that, it is wonderful... sits on my counter and all my cookie trays - whether fresh out of the oven or patiently waiting their turn - are neatly stacked. Ultimately, I love the space saving ability to handle multiple (hot) trays at once, but I hate the folding-it-up for storage process. I figured out how to close up the bottom tier of the rack.... just push the ends towards each other, and they clear the metal piece that locks them in the open position. I knew I was missing something! I've taken to having these for dinner during the week, since I head straight to the gym after work. I'll sometimes use the whole recipe as a meal replacement, but you can split it into two smaller servings, if you'd like. These were fantastic!! I used garlic naan, and a homemade blend of greek seasoning. Another winner from Elly Says Opa! Preheat the broiler (or grill, or pan on the stove). Sprinkle the chicken with salt and pepper on both sides, and then broil until cooked through, about 5 minutes per side, depending what size/type chicken you are using. Allow the chicken to rest for a few minutes before slicing into strips. Meanwhile, heat your pitas. I have a gas stove, so I just spray them with a little bit of oil and stick them right on the burner for a few seconds per side. 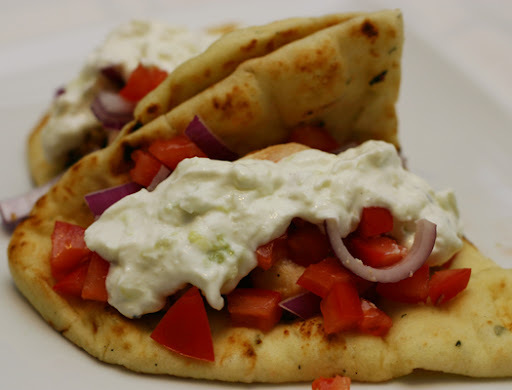 Top the pita with the chicken, tzatziki, tomatoes, onions. Roll up and eat! Mix together the strained yogurt, shredded cucumbers, garlic, vinegar and lemon juice (if desired). Salt to taste. It’s best to refrigerate for 30 minutes or more before serving, so flavors can meld. A lot of people put dill or mint in their tzatziki but I have never liked it as much that way. I’m a bit of a purist. My family always made it this way (without the dill/mint) and I much prefer it, but of course add herbs to your liking. 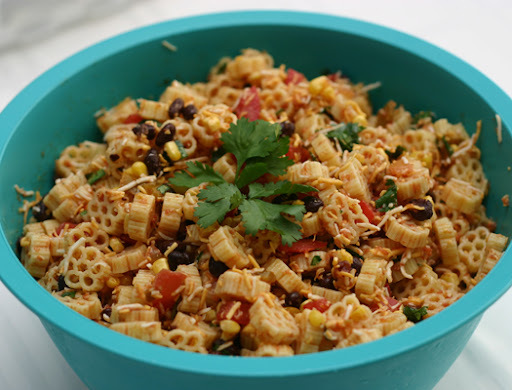 I've been hearing a lot of good things about Cara's Wagon Wheel Taco Pasta Salad, and with a party to go to, I finally had a reason to make it! 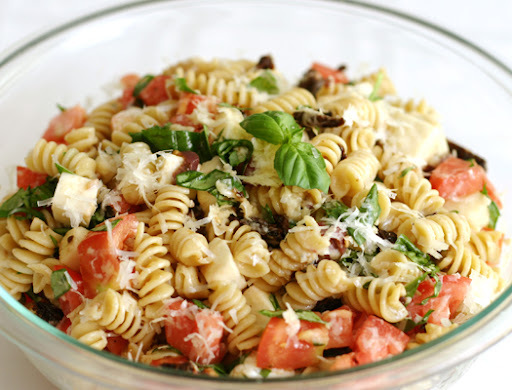 This is a delicious spin on pasta salad, with flavors my husband and I totally love. Let's just pretend the bowl doesn't clash with the food... I wasn't sure if this was the type of party where I'd see my bowl again or not, so I played it safe. A collaboration with Katie of Good Things Catered that was oh so right. Delicious and cute, if I do say so myself. I have made this recipe time and time again. TWICE in the span of a week at my mother in law's house when we were staying for Christmas. It is fantastic. 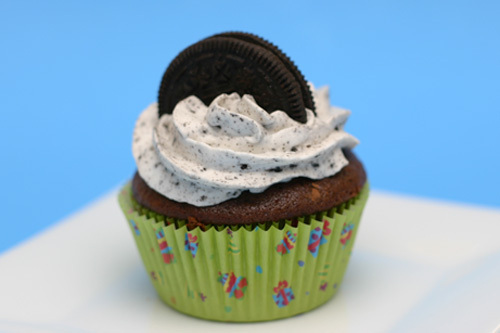 Totally fun, amazing whipped cream frosting, hidden oreos - what's not to love? I'll even take just the frosting on this one - it's awesome! 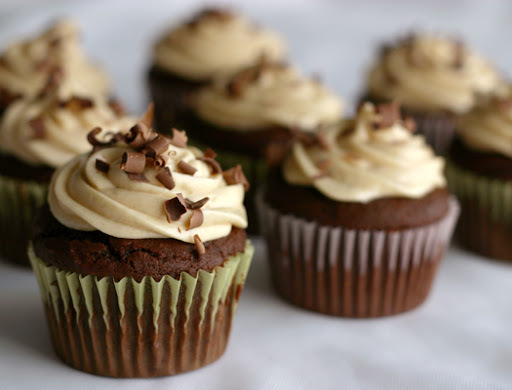 If you love the chocolate/peanut butter combo - this is your cupcake. If you like blueberry muffins, give these a try at least once - even if you already have a favorite recipe. They are amazing!! Mmmmm, so comforting during the cold, harsh winter! This dish is all we ever order from Chinese take-out, so I was super excited to find such a great homemade alternative. I never need to go to the Cheesecake Factory again, because now I can make my favorite dish at home! 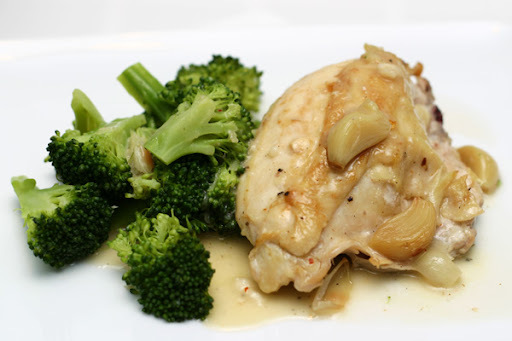 Not as scary as it sounds, a simply fantastic way to cook chicken. YUM. Leftover potatoes will never again go to waste in my kitchen. 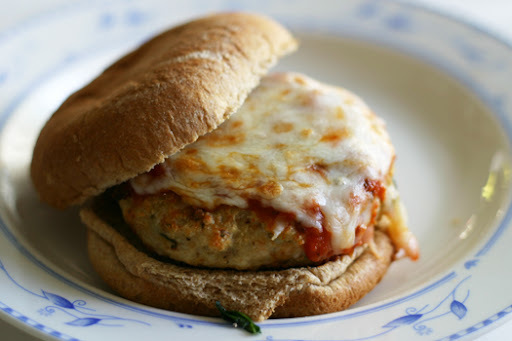 Elly's quick, easy, and scrumptious burgers have me wondering why I ever fire up the grill - a broiler works wonders!